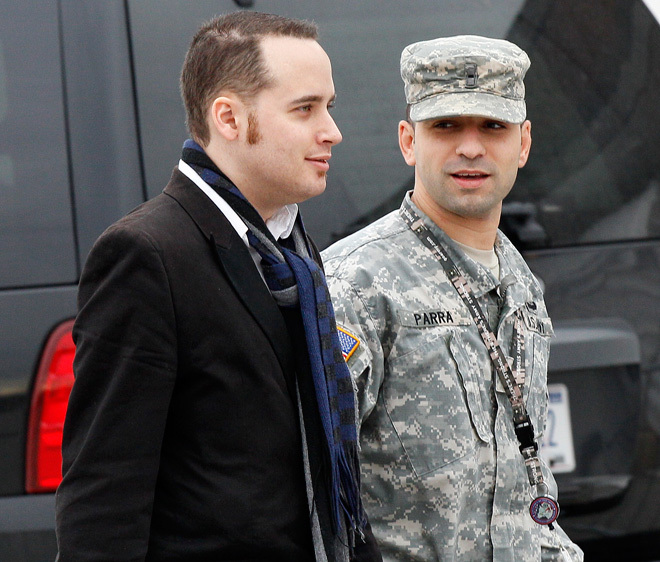 Accused WikiLeaker Bradley Manning sat in the same room with the man who undid his life on Tuesday, when former hacker Adrian Lamo took the stand on the fifth day of Manning’s pretrial hearing. Lamo, who turned Bradley Manning into the FBI and Army for allegedly leaking hundreds of thousands of sensitive government documents to WikiLeaks, denied in his testimony that he’d violated a journalistic or ministerial promise of confidentiality when he turned over the chat logs that led to Manning’s arrest. The 30-year-old ex-hacker said he’d decided just a day after first chatting over instant messenger with Manning, who used the handle “bradass87? in their online chats, to report the Army intelligence analyst. Lamo said he did so because what was being confessed was so “egregious” that it required action. Lamo, who’s been affiliated with the hacker ‘zine 2600, said that he considered himself a reporter, and that he was a minister with the Universal Life Church, which grants ministerial credentials over the internet. On cross-examination, Manning’s attorney David Coombs — who refused to refer to bradass87 in the chats as Manning — asked Lamo about the section of the logs where Lamo offered bradass87 confidentiality as a journalist and a man of the cloth. (10:24:07 AM) bradass87: assange level? Lamo responded that in their chat, Manning “neither declined nor accepted,” his offer of source protection. Lamo, who acknowledged in the hearing to being diagnosed with Asperger’s Disorder, used formal diction and circuitous language in his responses, in stark contrast to the sharp, definitive “yes” and “no” answers given by witnesses in the previous four days of testimony. He remained unperturbed throughout the hearing, however, even when things heated up between him and Coombs. Coombs pressed Lamo further, asking why Lamo told “bradass87? in their chat that “none of this is for print,” when he’d already given logs of their initial chats to law enforcement agents, and would later go on to give all of the chat logs to the government and to Wired.com. “It was not for print by me,” Lamo said, eliciting a snicker from the gallery. “So you thought Wired magazine wouldn’t print it?” Coombs asked. Lamo, who was convicted in 2004 for hacking Microsoft and the New York Times, responded that he gave the chats to Wired.com before he met with law enforcement agents a second time because he was “uncertain” if they would arrest him. “I was uncertain I would be coming back,” he said. Coombs’ cross-examination of Lamo sought to portray the former hacker as a duplicitous confidential informant who was trying to get Manning to incriminate himself. Coombs asked Lamo if he was acting as a minister, and then repeatedly asked, “Don’t you think he was contacting you for moral support?” At that point, Manning looked off into the short distance, perhaps recalling the state of confusion and despair that prompted him at the time to reach out to Lamo. Coombs and Lamo went back and forth over whether Lamo violated his responsibility as a “minister” to keep Manning’s confessions private. Coombs asked Lamo whether it wasn’t clear that bradass87 intended their chat to be confidential. “A reasonable person would conclude that,” Lamo conceded. Throughout Lamo’s testimony, Manning continued taking notes and occassionally leaning forward, looking at Lamo. Manning, dressed in fatigues and black-rim Army-issue glasses that he continually pushed back into place on the bridge of his nose, showed only a single moment of brief animation during the afternoon’s testimony by his former online confidante, after Lamo was handed a copy of the chat logs — dozens of pages long — and was asked if he recognized them. Lamo took several minutes to thumb through and look at each page while everyone in the courtroom waited, prompting Manning to lean back slightly at one point and turn a palm up as if in an expression of wonderment. Asked when he first contacted law enforcement, Lamo said on May 21 he contacted Timothy Douglas Webster, a psychology student at UC Santa Barbara and a former Army counterintelligence agent. In cross-examination by Coombs, it was established that Lamo contacted Webster because he wanted Webster to help him find the “right team for the job” who would handle the matter in a sensitive manner. That request eventually led to the Army’s Criminal Investigation Division. Lamo, who has a history of psychological disorders and drug abuse, said he wasn’t on drugs and was feeling “more normal than usual” when he recorded the chats and turned them over to law enforcement. Edwards first spoke with Lamo in late May, but didn’t actually take possession of Lamo’s computer until June 11 when he met with Lamo in California to collect his netbook and a hard drive from another computer. Asked if Lamo worked as a confidential informant for law enforcement, Edwards said that Lamo was not working for law enforcement at the time of his chats with Manning in May, but became a confidential informant for the Army starting in July 2010, and remained one until about three or four months ago. Lamo was not a paid informant, Edwards said, but the government did pay his expenses for travel and other costs associated with his research on its behalf and also purchased a hard drive to replace the one taken into evidence by the Army. The month that Lamo became an official informant, he contacted a Manning acquaintance named Danny Clark, and engaged him in a chat session that Lamo subsequently turned over to law enforcement. Edwards testified that in June he had tried to speak with Clark to interview him, but Clark declined to talk, invoking his right to an attorney. Lamo insisted that when he contacted Clark shortly thereafter on July 21, he wasn’t doing so with any intent to hand over information he obtained to law enforcement. “I was curious regarding his role in the WikiLeaks affair,” Lamo said. He admitted to being suspicious that someone, perhaps Clark, had helped Manning install encryption on his laptop. In chatting with Clark, Lamo wrote, “Let’s just agree neither of us is going to share these [chat logs] with anyone else.” But Lamo did indeed hand over the chats to agents. He told Coombs that he felt a “necessity that overrode the implied agreement” with Clark.